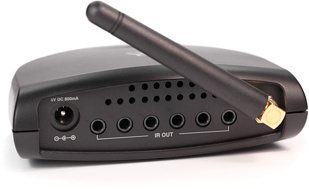 An available accessory for the Xsight Touch model is the RF Extender model ARRE433B. This compact device allows you to control standard infrared equipment that’s not in the line-of-sight – for example gear in another room, inside a cabinet or behind your sofa. 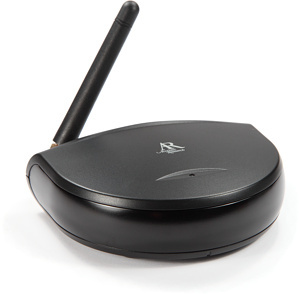 The Xsight operates at 433MHz, different from most RF remotes in this price range that use 418MHz. Generally speaking 433MHz isn’t nearly as “busy” as 418MHz, which should result in more reliable communications versus other similar RF remotes. The RF Extender is a half circle-shaped device that measures 3.94” wide, 3.45” deep and 1.30” thick (10.0cm by 8.6cm by 3.3cm), with a 3” (7.5cm) adjustable antenna (7.5cm) on the back. The bottom sports four small rubber feet, plus two holes in the case that can be used for mounting. A small red LED on the top of the Extender flashes when a command is received, and power is supplied courtesy of the compact wall wart DC adaptor. On the front is a generously sized “main blaster”, which can be used to send infrared commands to a large area such as the inside of an equipment closet. On the back are six 3.5mm headphone-style wired emitter jacks for controlling individual components; single-headed IR emitters are included. There’s literally no configuration needed to use the RF Extender – just plug it in, stick the emitters on your equipment and the Xsight Touch is ready to go. This is because the remote comes pre-configured to transmit both IR and RF at the same time, all the time (although this can be disabled using the onboard setup menu). The Extender’s IR emitter jacks are not individually addressable, and there are also no base IDs for using multiple Extenders in the same house. As with other RF-enabled remotes, the Xsight Touch cannot be used to directly control RF equipment. Except – and this is the first time I’ve been able to say this in the review – for one specific device: DirecTV receivers. The Xsight Touch is able to directly control DirectTV’s RF-enabled satellite receivers, and it doesn’t require the RF Extender for this to work. After adding a DirecTV device to the remote’s configuration as normal, a special setup option is enabled in the onboard settings menu to enter your box’s unique 6-digit ID code. A number of other advanced setup options are available on-remote. The beep on LCD key press can be disabled or adjusted between three different sounds (“beep”, “boop” and “chirp” – the last one being my favorite and least obtrusive). The LCD screen’s brightness can be set to three different levels, the backlight timeout changed to between 5 and 30 seconds in 5 second increments, and the automatic tilt sensor disabled. How stylish looks & feels. The Xsight’s hard plastic buttons are low to the surface of the remote with minimal separation between themselves and the case surface and limited key travel. Due to this the remote won’t be particularly easy to use blindly, although the [Pause] button and four color keys are easy enough to locate, and the [Volume] and [Channel] buttons can be hunted out via the matte texture and slightly raised [Mute] and [Jump] keys. What the hard buttons do offer is exceptional tactile feedback – you’ll definitely know when a button has been pressed. In fact, the Xsight could be the only remote where you can almost tell what button you’ve hit by the mere sound of it: the small horizontal buttons have a loud snapping sound (like the vacuum button on a juice bottle lid), the numeric keypad produces a more muted version of the same, while the rest of the keys make various clicking sounds.